Comments: BRAND NEW COPY. AS PICTURED. NEVER BEEN USED. READY TO SHIP TODAY. WILL EXPEDITE. '''FREE DELIVERY CONFIRMATION. Comments: Great condition for a used book! Minimal wear. 100% Money Back Guarantee. Shipped to over one million happy customers. Your purchase benefits world literacy! 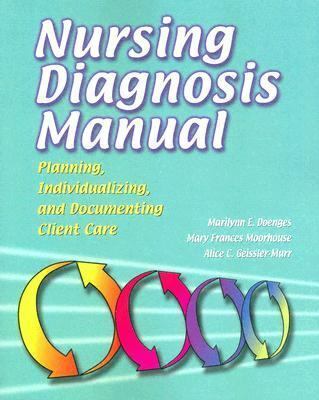 Marilynn E. Doenges, RN, BSN, MA, CS: Clinical Specialist, Adult Psychiatrict/Mental Health Nursing, Retired, Adjunct Faculty, Beth-El college of Nursing and Health Sciences, CU-Springs, Colorado Springs, Colorado Mary Frances Moorhouse, RN, BSN, CRRN, LNC: Nurse Consultant, TNT-RN Enterprises, Adjunct Nursing Faculty, Pikes Peak Community College, Colorado Springs, Colorado Alice C. Murr, RN, BSN, LNC: Legal Nurse Consultant, Telephone Triage Nurse, Colorado Springs, ColoradoDoenges, Marilynn E. is the author of 'Nursing Diagnosis Manual Planning, Individualizing And Documenting Client Care' with ISBN 9780803611566 and ISBN 0803611560. Loading marketplace prices 73 copies from $1.98 How does the rental process work?